When Kris Foote wrote on her volunteer application that she loved animals and kids, it immediately piqued the interest of the humane education chairperson at the Heaven Can Wait Animal Society in Las Vegas, NV. One month later the new volunteer was teaching five different second and third grade classes about animal abuse, pet overpopulation and treating animals with kindness. 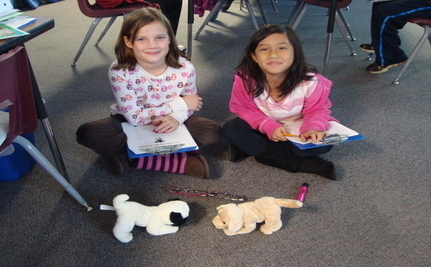 Twelve states have passed laws recognizing the importance of teaching humane education to children. It raises their level of empathy for other living creatures and can stop the link between cruelty to animals and domestic violence. Most programs require the classroom teacher to do the work of learning the lessons and teaching it to the students. Heaven Can Wait’s Angels for Animals program was no different. There were great materials, but with the heavy workload of teachers only the most motivated took time to download and implement the program. So when Kris Foote volunteered to take Angels for Animals directly into the class, there were leaps of joy from the rescue group and the schools. Five second and third grade classes immediately scooped her up. 2. During the Please Don’t Litter class, Kris put up pictures of houses with velcro dots on them and the kids placed animals on the velcro dots (2 per house). When the houses were full, the students put 4 animals in a shelter. When the shelter was full, there were animals left over. During the program the students wrote stories about pets becoming part of a family, they completed math problems that taught about pet overpopulation and they came up with ideas on how to stop animal abuse. They also put together toys for the dogs rescued by Heaven Can Wait. They wanted the to canines to have a toy to take with them to their new adopted homes. Angels for Animals was created by Kim Yates, who is a teacher and board member for Heaven Can Wait. It can be downloaded “free of charge” by every teacher that would like to make use of it. 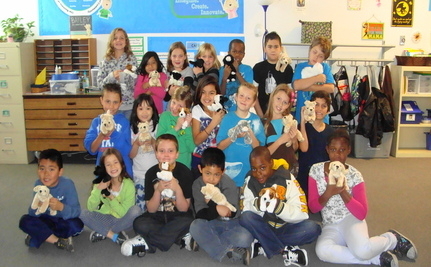 Thanks to Kris Foote, Ms. Bailey's class had a full 4-week humaned education program. Mason Buckles Up For The Sweetest Ride Of His Life. Thank you for sharing this so interesting article that I save it as a pdf ! Ideally these important qualities should be taught in every home, but, obviously, they are not. I agree with IDA W. that real animals should be brought into the classroom but only after a trial period with stuffed ones. I would even like more classes for later grades to learn about our wildlife and their significance on the planet we share. What could be more worthwhile than to redirect the frightening path of selfishness and cruelty that we are presently on? Having mandatory classes in every school could change the bleak future of our animals and other humans into a brighter, more compassionate and empathetic one. Every living being benefits. It is the best thing that a teacher can give to kids. Lets be honest nobody grades without knowing an alphabet and ability to write, but there are thousands of people who graduate without an ability to love and take care. It is not only about the animals, because such graduates cannot be kind to other people and have problems in their families. You know, it is great that I met this article while I am still writing my dissertation. I even decided to use this resource to get more time and understand how to bring up harmonious personalities, instead of just making them learn the rules. Such a great idea, always told my son and the grandkids to be gentle with animals, as they have feelings the same as us, animals can sence who are cruel to them, thank you for sharing.